KB Bank (President Heo In) has become the first South Korean financial business to introduce vein authentication service. 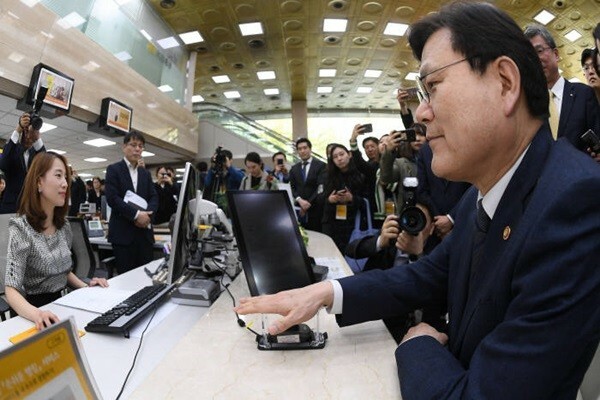 It has established South Korea’s first biometric authentication bank window where one can withdraw money even without a seal, a password, or a Smartphone. Although there were cases where vein authentication was applied to kiosks or ATMs, this is the first time when biometric authentication process is applied to bank window. KB Bank announced that it launched ‘Withdrawal Service through Hand’ where money is withdrawn at a window of a bank branch through vein authentication. Launch party that was held at KB Bank’s main branch in Yeooui-do on the 12th had Chairman Choi Jong-gu of Financial Services Commission (FSC), Chairman Kim Hak-soo of Korea Financial Telecommunications & Clearings Institute (KFTC), Chairman Yoon Jong-kyu of KB Financial Group, President Heo In of KB Bank, and executives and employees of relevant departments in attendance. This service is a new withdrawal service that allows one to withdraw money through vein authentication even without a bankbook, a seal, or a password. KB Bank collects and encrypts information on veins of individuals and stores them along with KFTC at a fixed ratio. When one’s identity is distinguished and registration is completed, he or she can withdraw money without any limit to amount of money or number of withdrawals afterwards. This service breaks traditional practice based on bankbooks and introduces window payment process based on a new concept and it is expected to drastically reduce amount of time it takes to process reports of lost bankbooks and to check whether one’s identification and seal is matching. It is also expected to greatly increase efficiency of tasks and productivity and level of convenience of window transactions especially for older people who have higher chance of losing passwords. Out of 18 million people who use KB Bank, 3 million people tend to visit KB Bank’s branches in person and 800,000 people out of 3 million people are 60 years and over. Supervisory authorities such as FSC and others are actively supporting this new service by KB Bank. KB Bank received an authoritative interpretation from FSC back in December regarding withdrawal from a bank window only through biometric authentication and it received an approval to revise basic terms of transactions of deposits from Financial Supervisory Service in January and prepared groundwork for withdrawal from a bank window using biometric authentication. Meanwhile, KB Bank held proclamation ceremony for DT (Digital Transformation) in last November and it has been putting much efforts into digital innovation. It has been introducing innovative financial services such as an interactive banking platform service called ‘Liiv TalkTalk’ that allows one to have financial transactions with a bank teller just like they are having a conversation and ‘KB StarShot’ that allows one to pay utility bills by taking pictures through a Smartphone and receive bankbooks and certificates through mails.